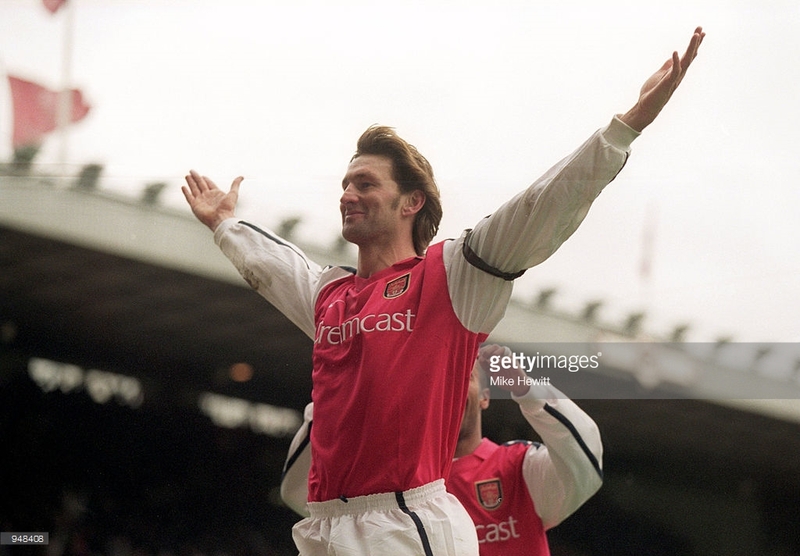 Whenever I look back on my 70 years of supporting Arsenal and the hundreds of players that I’ve watched one name always stands out in my memory – Number 6, Tony Adams who is rightfully known as Mr. Arsenal. He was born in Romford on October 10th 1966 and grew up in Dagenham. From 1971 to 1978 he was a pupil at Hunters Hall Primary School and from 1978 to 1983 at Eastbrook Comprehensive School. He was still a 15 year old schoolboy when he signed for Arsenal in 1980 and one of his tasks was to clean the players’ boots after games. He made his first team debut just four weeks after his 17th birthday. 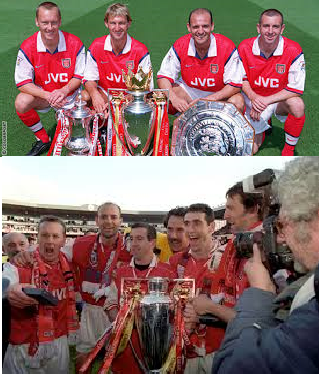 Along with Lee Dixon, Nigel Winterburn and Steve Bould he was part of the “famous back four” that formed Arsenal’s formidable defence; he became Arsenal captain at the age of 21 and remained as club captain until his retirement – 14 years later. Adams’s strong discipline of the defence was considered a factor in Arsenal winning the League Cup in 1986–87. 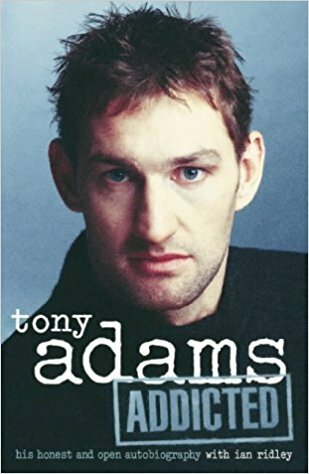 For Arsenal fans, there has arguably been no other player in the Club’s history who has encapsulated the spirit and quality of the club more than Tony Adams, a colossus of a defender who is considered by many as one of the finest to have played for England and Arsenal. His successes on the field were challenged by a decade long (1980-1990) battle with alcohol. On 6 May 1990 he crashed his Ford Sierra into a wall and his blood alcohol level was more than four times the legal limit. He was imprisoned for four months and freed after serving half of his sentence. He became one of the most high-profile recovering alcoholics in the UK and his battle with alcohol is detailed in his autobiography, Addicted, which was released to critical acclaim in May 1998. 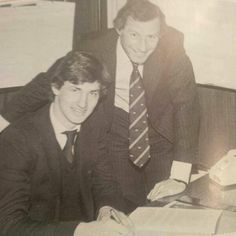 He won the First Division championship twice; the first being after our famous Friday night victory over Liverpool at Anfield which secured the 1988–89 Championship. The second was in 1990–91, after losing only once all season – (W24, D13, L1, GF74, GA18). In 1992–93 he gained the distinction of being the captain of the first English side to win the League Cup and FA Cup double. 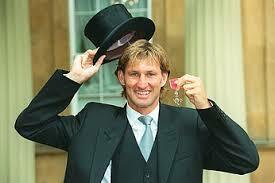 Then in 1993-94 he was captain when we won the European Cup Winners Cup. Number 3 on Arsenal.com top 50 players. Number 3 on Arsenal Arsenal top 50 players. A statue honouring Adams was unveiled at Emirates stadium on 9 December 2011. This entry was posted on Thursday, October 26th, 2017 at 10:30 am and is filed under Uncategorized. You can follow any responses to this entry through the RSS 2.0 feed. You can leave a response, or trackback from your own site. I thought it strange that the comments stopped on the Carabao cup post, not realising that a new post was up, I couldve been waiting on there for months…. 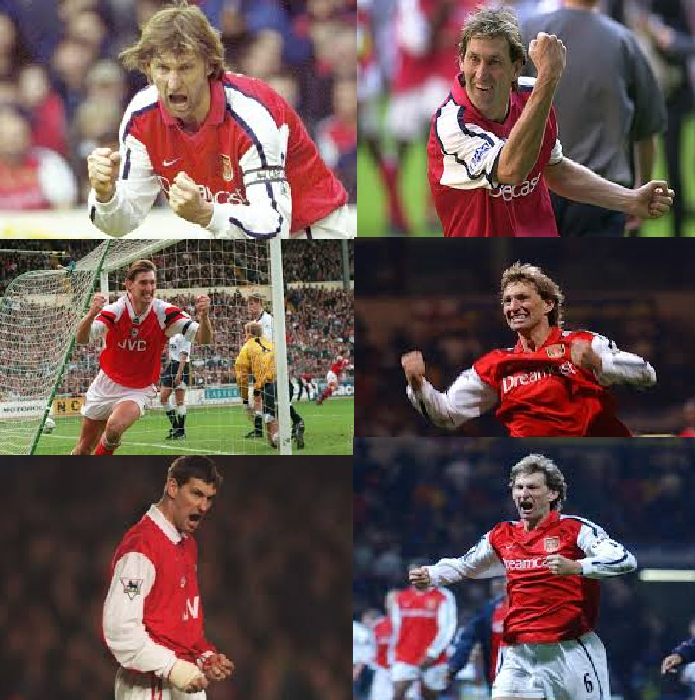 Big Tone will forever be a legend for his playing career at Arsenal. GN5. Super stuff about a true Arsenal legend. I had the privilege of meeting TA on many occasions. We could really use him now though he would pick up red cards every other week. West ham at home, seems ok to me. Mustafi should be back in the first team so the BFG would play. Debuchy, BFG, Holding at the back with Elneny, Coquelin and Wilshere in front sounds good. Welbeck may need game time so, Welbeck, Giroud and Walcott up front might work. I forgot Chambers, hey we should win that. I think I’ll buy a ticket. I did the same Eddie. We must be on the outer as everyone else seemed to know there was a new post. So poor Sir Chips got abused at the AGM. No need for that type of behaviour towards an Arsenal man. What next – they abuse Pat Rice or heaven forbid, Arsene Wenger? Raddy, They seem to think that their 5 bobs worth of shares give them the right to abuse people that dedicate their lives doing their level best to make our club great – and they show the class of the village idiots. Thanks for your help yesterday Chas. Who might play against Swansea City this Saturday? And when are our absentees likely to return? Well, basically the squad that was available against Everton is available and, for the rest, decisions will be made if they will come in or not. I will make that decision tomorrow [Friday]. But overall everybody is available [from last weekend], and everybody who played on Tuesday night is available as well. The only players who are not completely back are Mustafi and Welbeck. Calum Chambers is back in full training on Monday and Ospina has a chance to be available against Belgrade. He will not be available for Saturday. ‘The people who run the club are too busy worrying about making money to bother making sure the team is well run’ say the fans who are too busy worrying about AGM’s to bother making sure the team is well supported…. This probably sounds odd but I never talk about football, this is my only outlet. Better get going its a 3’oclock kick off.